Senior living giants Emeritus and Brookdale closed a merger deal Thursday, according to a new release. The deal was first announced in February. After absorbing Emeritus, Brookdale now owns 1,150 communities in 46 states, with the ability to serve 110,000 residents. Emeritus operates the Montclair Park community in Poulsbo (pictured). We took a close look earlier this year at how the merger might impact the local community, and the trend of ownership changes in assisted living. UPATE: Regence and Harrison agreed to a temporary contract extension late Wednesday. The contract, previously set to expire Wednesday afternoon is now good through mid-August. Eight Kitsap Companies were among the 16 semi-finalists announced in Kitsap Bank’s inaugural edg3 FUND competition. The contest recognizes small businesses that benefit their communities economically, socially or environmentally. The winner will receive $20,000. The Doctors Clinic is still in-network with Regence. The Silverdale-based medical group is stressing that point this week as a contract standoff continued between insurance company Regence and Harrison Medical Center. The Harrison/Regence negotiations have created confusion for some patients of The Doctors Clinic, in part because physicians for The Doctors Clinic do provide services at Harrison facilities. Dr. Randall Moeller, president of The Doctors Clinic, said the group sent voice messages to patients assuring them Regence insurance will still be accepted, regardless of the outcome of the Harrison negotiations. The Doctors Clinic will still accept Regence Insurance plans after August 1, 2014. The contract dispute with Harrison Hospital does not affect in network coverage with The Doctors Clinic. All services from The Doctors Clinic — Physician visits, urgent care treatment, lab work, and surgery in our Ambulatory Surgery Center will continue to be considered “in network” through Regence. UPDATE: Here’s our story on the sale of Bethel Junction. A Bethel Junction shopping center that includes a Safeway and Big Lots has sold for $20.8 million, according to the Puget Sound Business Journal. The buyer was a San Diego investment group. The 157,500-square-foot development was built in phases in 1989 and 1998, according to a commercial listing. Assessor’s documents list the most recent owner as Tavitac Corporation. We’ll post more details as we get them. The Kitsap County unemployment rate fell to 5.1 percent by the end of June, due mostly to continued decline in the labor force. Meanwhile, the number of people working for Kitsap County employers remained unchanged from 2013. An estimated 1,050 people left Kitsap County’s labor force (stopped looking for work) in June, according to the state Employment Security Department. That negated a labor force gain in May. Another residents 130 were hired. The decline to the labor force and slight increase in employment dropped unemployment rate among Kitsap residents to 5.1 percent, a full 2 percent lower than in June 2013. Is it time to rename SKIA? The Port of Bremerton needs to recruit manufacturers to the slow-growing South Kitsap Industrial Area. But most companies outside the region have never heard of Kitsap County, let alone its southern extremities. Given the county’s lack of name recognition, port Commissioner Axel Strakeljahn believes it’s time to rebrand SKIA. His solution? 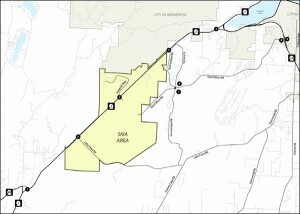 Give the 3,500-acre industrial area a name that reflects the broader region. “Puget Sound Industrial Center” was one suggestion. 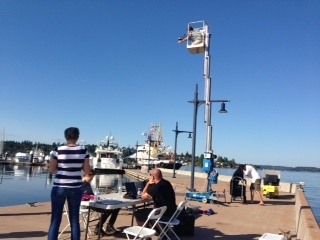 Bremerton Marina will soon be the backdrop for a “major” car manufacturer’s international ad campaign. A photo crew shot images at the marina Monday evening. The ads will roll out in about five to seven months, according to Port of Bremerton staff. Port of Bremerton commissioners will hear a recap Tuesday evening from a delegation that visited the Farnborough International Airshow last week to promote the aerospace industry in Kitsap. 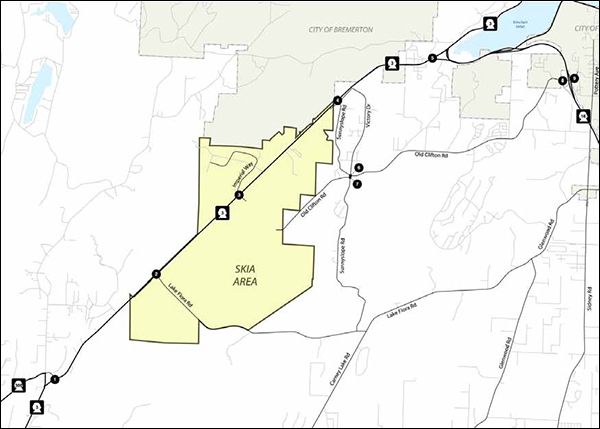 Kitsap Economic Development Alliance will also present a quarterly report and commissioners will consider a granting an easement for a portion of a fiber optic cable that will stretch across Sinclair Inlet.